BLACKSMITH FORK CANYON—“Scotty, Norman, step up! Step up boys, come on!” As Rebecca Moses prompted the two handsome Percheron horses, the sleigh slid easily over the snow toward the meadow filled with hundreds of Rocky Mountain elk. The elk, mouths filled with hay, swiveled their heads to stare at the pointing fingers and smiling faces in the sleigh. Some of the younger elk hid behind their moms, and some bounded away. But most just stood placidly in the sunlight and watched the sledge glide past. This is not an exotic, overpriced, foreign vacation spot. Hardware Ranch Wildlife Management Area (www.hardwareranch.com), part of the Cache National Forest, provides a safe habitat for wildlife and an educational resource for residents 15 miles east of Hyrum. Moses, a parks and recreation student at Utah State University from Blanding, is a wagon driver and interpreter at the Ranch, where herds of elk shelter during northern Utah winters. On this Saturday, she was leading a group of visitors on the sleigh ride, and discussing the lives of the elk. Most of the elk now at Hardware Ranch are cows—female elk—about 80 percent of which are pregnant, she said. “On average,” she said, “an elk eats 30 pounds of feed per day,” which keeps the staff at the preserve busy. The cows and their calves usually stay within a 20-mile area around Blacksmith Fork Canyon, but the bulls—male elk—usually remain higher up the mountains unless a serious winter storm drives them down. Moses said bulls weigh anywhere from 500 pounds to 800 pounds, while the females are 300 pounds to 500 pounds. Newborn calves weighs about 35 pounds. The only way to tell the age of an elk is to pull a molar, she said. “Their teeth grow a lot like trees—they have a layer for every year.” She is quick to answer questions, and it is apparent that she enjoys her work at Hardware Ranch. Her favorite thing about the job, she says, is talking with visitors and working with the horses. Information officer Kelly Pitcher, from Smithfield, also enjoys working with the animals. “Working with the horses is always a good time,” said Pitcher. Pitcher likes working at Hardware Ranch. “No smog, no fog, no cell phones working,” he said. The elk herd moves in and out of the meadows at Hardware Ranch, depending on the weather, said assistant manager Marni Lee. On Saturday, there were 401 elk, down from 450 the day before. Lee, now in her seventh season at Hardware Ranch, handles visitor services and conservation outreach activities. The Utah Division of Wildlife Resources purchased the first part of the Ranch in the 1940s and set it aside as a wildlife management area. Over time, more land became available and the ranch now covers more than 14,000 acres in the Logan Ranger District. 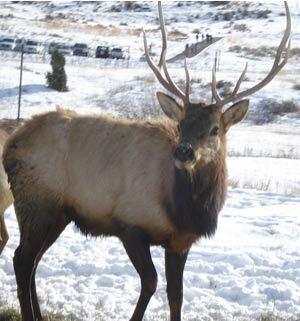 Hardware Ranch depends on community support and volunteers, and invites families and community groups to come enjoy the elk and the land, both during the winter elk season, or for hiking and picnicking during summer. The ranch is seeking funding and staff to start year-round programs, Lee said. Lee stresses that providing public access is central to the purpose of Hardware Ranch. “We are a wildlife management area and we like to instill that love of wildlife in everyone that comes up here,” she said. “That’s one of our end goals. You come to Hardware Ranch and you see these elk on the sleigh ride, and you leave thinking you want to make Utah’s habitat better for the wildlife,” Lee said. For more information visit www.hardwareranch.com.